This T&F is always very competitive with clubs coming from Kerry, Cork, Limerick, Wexford, Waterford, Kilkenny, Kildare and Tipperary. For some of our athletes it was their first competition or first time trying events so it was a great start to the track & field season for them. 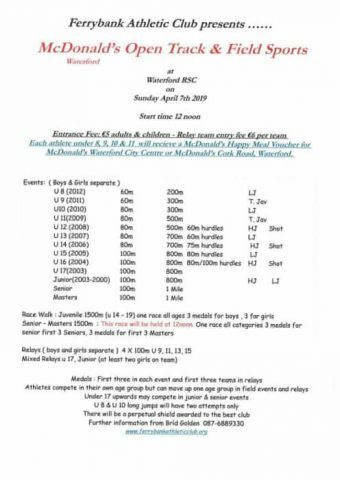 Three of our athletes won medals and with McDonalds vouchers given to every athlete from U9-U11 each family dutifully made their way to McDonald’s on the way home. Great day of athletics for all. U8: Mia Kennedy and Aaron Carrigan did great in the 60m missing out on qualifying for the finals. Mia did the 300m and came well up in a big field. U9: Heidi Ryan came 2nd in turbo with a throw that matched 1st so the second throw became the deciding throw. She also competed well in the 60 and 300m. Holly made it to the final of the 80m sprint and did very well. Holly and Evan both came well up in the 300m. U10s also competed well in the turbo and long jump too. U11: Daniel Corbett, Ross Murray, Odhrán Prendergast. The boys ran well in the 80m and 500m. Odhrán came 3rd in a very close finish. They also had a go at Shot, turbo and high jump and did great. The u11s came 5th in the relay with Evan from U10 joining to make 4. U12 : Órla Brennan came 2nd in the Shot Put. Charlie Ryan and Noah Denieffe tried Hurdles, Long Jump, High Jump and Shot and 60m. Noah was 4th in the Shot and Charlie 4th in the Long Jump. U13: Liam O’Dwyer was just pipped for a medal coming 4th in the 80m final and had a fall in the hurdles.